What is Samsung In-App Purchase? Samsung In-App Purchase, also known as Samsung IAP, is a payment service that makes it possible to sell a variety of items in applications for Samsung Galaxy Apps. In-App Purchase can be used either to make a one-off payment or to pay for a regular subscription. Items that can be sold via In-App Purchase include premium content, virtual goods such as in-game items, and specific services with different length license terms. From Version 5 onwards, Samsung In-App Purchase SDK offers new functions by providing new Product Types, a Consume API, Pass-through parameters and enhanced subscription features. With the new features, it is possible to provide various subscription models to users with enhanced security. From Version 4 onwards, the additional payment module does not have to be installed on users' device when running Samsung In-App Purchase for the first time. With the improved payment interface, it is much less likely that users will deviate from the payment process, which contributes to more stable revenue growth for application developers. Payment methods including credit card, phone bill, and PayPal are available for Samsung In-App Purchase in over 90 countries around the world. Other payment options will be added over time. To apply Samsung In-App Purchase to your applications successfully, make sure you read the following documents thoroughly. Samsung In-App Purchase not only supports Android devices but also the Tizen-based Samsung Gear. To sell items in applications exclusive to the Samsung Gear, a sound understanding of the Tizen SDK is required. The In-App Purchase feature can be implemented by using the Extension SDK. Check out the opportunities for generating revenue through the Samsung Gear by clicking the following link. The SDK runs on Samsung devices with Android 4.0 Ice Cream Sandwich or above. Q01 What are the guidelines for my in-app item titles? Use these guidelines to create impressive in-app item titles. You can increase your in-app item revenue by registering titles that are impactful but do not distract customers. Use words that describe the purpose and distinctiveness of the in-app item. Shorter titles have more impact. Customers may not remember longer titles. Capitalize the first letter of the first word and each major word thereafter. Do not capitalize all the letters. Do not capitalize the first letter of minor words, which include conjunctions (and, or, for), articles (the, a, an), or prepositions with fewer than five letters (in, on, over, with). Use numerals instead of spelling out numbers ('3' instead of 'three'). Do not use special characters or symbols (such as 'ü' or '©') that are not displayed in the app store UI. Q02 How can I test Auto-Recurring Subscriptions during app development? In developer test mode, the period for auto-recurring subscriptions is two hours. After two hours, they will be unsubscribed to support repurchase testing. This compressed time to test is only supported in developer test mode. Q03 Can I use Samsung IAP on non-Samsung devices? Q04 What kind of process is there to communicate with the server for item purchase transaction? - Upon purchase, an encrypted token for the transaction is issued to the third-party app. - When the purchase is complete, without any issues, the token is sent to the developer’s server. - The developer’s server sends the token to the Samsung Apps verification server to verify the transaction. Once the transaction is verified, the user can receive the purchased item. The complete verification process is explained in the In-App Purchase Programming Guide. subscription by utilizing the checkARSStatus API. Q05 What types of payment methods are supported by the Samsung In-App Purchase (IAP) library? Samsung IAP supports Credit card by default in countries where Galaxy Apps becomes a paid service. Phone bill, PayPal, and local payment methods are available in some countries. When it comes to in-app subscriptions, Credit card is the only payment method in countries except several Middle Eastern countries. You can find further information in Galaxy Apps Seller Office. Q06 Are monthly payments supported by IAP? Yes. Non-Recurring Subscriptions are supported in IAP 2.0 and Auto-Recurring Subscriptions are supported in IAP 3.0. Q07 Is it possible to self-test an app under development in real mode, without submitting it to the seller's site? With IAP v4.0, or newer versions, you can test billing, just like commercial apps, using the Closed Beta Test option in Galaxy Apps Seller Office. You can perform a mock purchase test during a closed beta test without incurring any fees if you register Samsung accounts as License Testers in Seller Office > Profile. To learn more about how to perform an IAP billing test using the Closed Beta Test option, please refer to the Application Registration Guide in Seller Office. With IAP version 1.95 and lower, real mode test is only available after the app is verified and distributed for public use. Before its distribution, you can test the payment with developer test mode (1 or -1) and you can set the mode in the setOperationMode(mode) method of IAP Helper. If you test an undistributed app in real mode by setting the mode to production mode (0), an IAP_ERROR_PRODUCT_DOES_NOT_EXIST error occurs because there is no item distributed for public use. 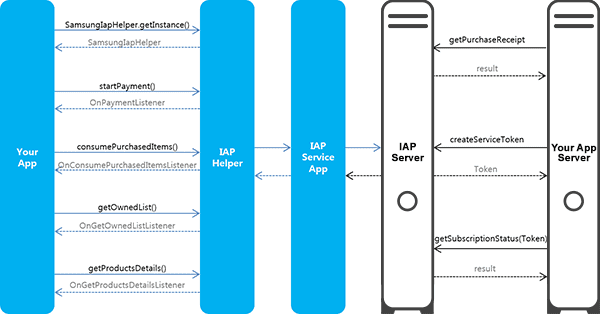 Q08 How can I test an IAP during app development? You can test the payment process by setting Development Mode to developer test mode: 1 (success) or -1 (fail). Please note that you must set Development Mode to 0 (real payment) when you actually sell in your apps. In IAP v2.0 or later, the parameter values for the setOperationMode(mode) method of IAP Helper can be set to -1, 0, or 1 and tested. Please refer to the Programming Guide for further details. With IAP v4.0, or newer versions, you can perform tests both in Developer Test mode and using the Closed Beta Test option in Seller Office. To learn more about how to perform an item purchase test using the Closed Beta Test option, please refer to the Application Registration Guide in Seller Office. Q09 Which time zone determines the purchase date (getPurchaseDate)? The purchase date is provided as GMT+0. Q10 What kinds of items are supported by Samsung IAP? IAP v2.0 and later supports consumable items, non-consumable items (based on accounts), and non- recurring subscription items. IAP v3.0 supports auto-recurring subscriptions item. Please refer to the Programming Guide for further details. - Consumable items: Disposable items for one-time use. They cannot be restored. - Non-consumable items: Restorable items that are account-based. READ CAREFULLY BEFORE USING THE SDK: THIS SDK LICENSE AGREEMENT (“AGREEMENT”) IS A LEGAL AGREEMENT BETWEEN YOU(“LICENSEE”) AND SAMSUNG ELECTRONICS CO., LTD.(“SAMSUNG”) AND IS EFFECTIVE UPON YOUR ACCEPTANCE. BY CLICKING ON THE “I AGREE” BUTTON, INSTALLING, COPYING OR OTHERWISE USING THE SDK, YOU AGREE TO BE BOUND BY THE TERMS OF THIS AGREEMENT. IF YOU DO NOT AGREE TO THE TERMS OF THIS AGREEMENT, DO NOT CLICK ON THE “I AGREE” BUTTON AND DO NOT INSTALL OR USE THE SDK. "SDK" means Samsung Enterprise SDK, which includes the APIs, applications, Documentation, data, files, libraries, materials, IDE (Integrated Development Environment), Sample Code, software (source code and object code), simulators and tools provided or made available to Licensee by SAMSUNG pursuant to this Agreement for use in connection with the development of Applications, including any Updates that SAMSUNG may provide or make available. For the purpose of clarity, SDK is SAMSUNG’s proprietary information and software is considered neither as open source nor in the public domain. This Agreement is effective upon Licensee’s acceptance, by clicking on the “I AGREE” button, and continues to be effective until terminated by Licensee or SAMSUNG in accordance with Clause 9 (“Term”). (b) If an Application captures, collects or records any form of user or device data, images, pictures or voice data (collectively "Recordings"), or processes, maintains, uploads, syncs, or transmits any form of user data, content or information (collectively "Transmissions"), such Recordings and Transmissions must comply with all applicable laws and regulations (including but not limited to privacy laws) as well as any SAMSUNG’s internal policies or requirements in relation to such matters (including but not limited to any notice or consent requirements). In particular, Licensee must ensure that a reasonably distinctive and conspicuous visual indication that a Recording is taking place is displayed to the user as part of the Application. (d) Applications must comply with all applicable laws and regulations (including the laws and regulations of any jurisdiction in which the Applications are offered or made available) and SAMSUNG’s internal policies and regulations. Especially, in respect of any Application that uses the Health package, Licensee shall comply with any and all of SAMSUNG’s registration processes. Before Applications are available to customer, end users or the public, Licensee shall obtain all required and necessary permissions and/or approvals from relevant government authorities. In addition, in respect of any Application that may collect, transmit, maintain, process, share, disclose or otherwise use personal information, location information, health information or other data that relates to a user ("User Information Handling"), Licensee shall comply, and the Application must be compliant, with all applicable privacy and data collection laws and regulations with respect to such User Information Handling. Licensee must ensure that any processing or transmission of the end user data is conducted in a manner that preserves the accuracy and security of the data. Licensee must not design or market Applications for the purpose of violating any legal rights of any person (including but not limited to privacy rights). (e) Without limiting Licensee’s obligations under paragraph (f), Licensee must ensure that any Application that offers health information or location information based services or functionality notifies and obtains consent from an individual before the individual’s health or location data is collected, transmitted or otherwise used by the Application. In addition, Applications that use health information based APIs shall comply with SAMSUNG’s registration process. (f) Applications that use location-based APIs for real-time route guidance, MUST NOT BE USED FOR ANY EMERGENCY OR LIFE SAVING PURPOSES DUE TO ITS INACCURACY and Licensee must have an end user license agreement in relation to such Applications that includes the following notice: "REAL TIME LOCATION DATA ACCESSED VIA THIS APPLICATION MAY BE INACCURATE OR INCOMPLETE. LICENSEE’S USE OF THIS APPLICATION IS AT ITS SOLE RISK." Licensee shall not use the Application for nuclear energy equipment, air traffic control, the operation of communication system, public transportation control, life support devices, or other devices that may cause deaths, injuries or severe physical or environmental losses in the event that the Application fails to perform in such devices. Any attempt to do so shall be deemed as a material breach under this Agreement. (h) If an Application includes any Third Party Software, Licensee must comply with all licensing terms applicable to such Third Party Software. However, Licensee shall separate the portion of the Third Party Software from the portion of the SDK in Licensee’s Application and shall not cause the portion of the SDK in Licensee’s Application, any derivative works thereof, and/or SAMSUNG’s Confidential Information to be subject to the licensing terms applicable to such Third Party Software (e.g., public disclosure, public distribution). Licensee shall indemnify, defend and hold harmless SAMSUNG, its distributors and its customers from and against any and all claims, demands, damages, costs or expenses (including reasonable attorney’s fees) and liabilities arising out of or in relation to the use of Third Party Software. (k) Licensee shall promptly respond to SAMSUNG regarding the use of policies and APIs in connection with the Application and/or SDK, upon SAMSUNG’s request. (l) Licensee warrants that the use of Licensee’s Application does not and will not infringe the intellectual property rights, or other proprietary rights of any third party and shall immediately notify Samsung in the event of any such infringement. (n) Licensee acknowledges and agrees that in connection with Licensee’s use of the SDK, Samsung may collect and use information about the Application and use of Application. Licensee shall obtain all consents from the users of the Application necessary for Samsung to use the foregoing information for the purpose of improving SDK and for providing services, if any, related to the SDK. For the purpose of clarity, Samsung reserves the right to charge for use of the SDK in the future. SUBJECT TO TERMS AND CONDITIONS OF THIS AGREEMENT AND TO THE FULLEST EXTENT ALLOWED AND PERMITTED BY APPLICABLE LAWS AND REGULATIONS, SAMSUNG SHALL NOT, UNDER ANY CIRCUMSTANCES, BE LIABLE TO LICENSEE OR ANY THIRD PARTY THROUGH LICENSEE FOR PERSONAL INJURY OR ANY CONSEQUENTIAL, EXEMPLARY, INCIDENTAL, INDIRECT, PUNITIVE OR SPECIAL DAMAGES WHATSOEVER, INCLUDING, WITHOUT LIMITATION, DAMAGES FOR LOSS OF PROFITS, LOSS OF DATA, BUSINESS INTERRUPTION OR ANY OTHER COMMERCIAL DAMAGES OR LOSSES, ARISING OUT OF OR IN RELATION TO THIS AGREEMENT, LICENSEE’S USE OF THE SDK, OR LICENSEE’S DEVELOPMENT OF APPLICATIONS, WHETHER BASED ON BREACH OF CONTRACT, BREACH OF WARRANTY, TORT (INCLUDING NEGLIGENCE), PRODUCT LIABILITY OR OTHERWISE, EVEN IF IT HAS BEEN ADVISED OF THE POSSIBILITY OF SUCH DAMAGES AND NOTWITHSTANDING THE FAILURE OF ESSENTIAL PURPOSE OF ANY REMEDY. THE SDK LICENSED HEREUNDER IS NOT DESIGNED OR INTENDED FOR USE TO ENABLE THE DESIGN OF APPLICATIONS USED IN ANY MEDICAL, LIFE SAVING OR LIFE SUSTAINING SYSTEMS, TRANSPORTATION SYSTEMS, NUCELAR SYSTEMS, OR FOR ANY OTHER MISSION CRITICAL APPLICATION IN WHICH THE FAILURE OF THE SDK COULD LEAD TO PERSONAL INJURY OR DEATH OR FOR USE IN ANY SECURIT-RELATED USE CASES. LICENSEE’S UNDERSTSANDING, ACKNOWLEDGEMENT AND ACCEPTANCE OF THIS AGREEMENT ARE THE LEGAL BASIS AND CONSIDERATION FOR THE LICENSES GRANTED UNDER IT. To the fullest extent permitted by law, Licensee agrees to indemnify, defend and hold harmless SAMSUNG, its Affiliates, directors, officers, employees, independent contractors and agents (each a "SAMSUNG Indemnified Party") from any and all claims, losses, liabilities, damages, expenses and costs (including without limitation reasonable attorneys fees) (collectively "Losses") incurred by a SAMSUNG Indemnified Party as a result of Licensee’s (or an Authorized User’s) breach of this Agreement, any claims that the Applications violate or infringe any third party intellectual property or proprietary rights, or otherwise related to or arising from Licensee’s (or any Authorized User’s) use of the SDK, the Applications or Licensee’s (or any Authorized User’s) development or distribution of Applications.